I received the book “Different Kinds of Special” this week, written by author and poet Donna Carol Koffman. She is the grandmother of a little boy named Reese that has autism and it is for him that she writes this… or at least, he was the inspiration. 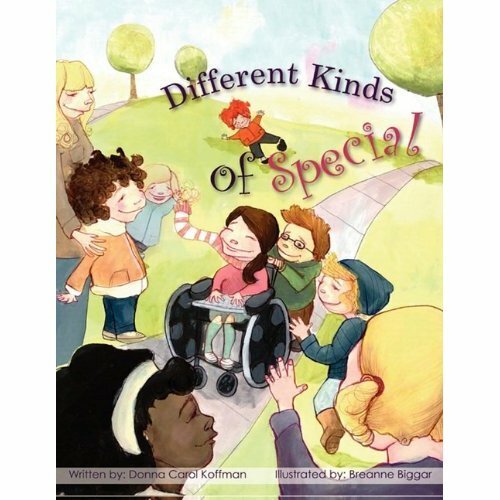 Also, an interesting bit of trivia for those of you that have or get this book… the illustrations are done by Breanne Biggar but, one page, where the children are drawing on a sidewalk, you will see the wonderful art work of a young man named Devin, who has Aspergers. He was 6 when he made those drawings and you can read a bit about him at the back of the book. While there really isn’t much of a story, it does take you along on a bit of a journey through the park. It’s kind of like people watching, but for children. As you go through it, you really feel like a child standing there while your mom or dad talks to you about what you see. And that’s how I felt, and I’m a dad. To invoke that kind of feeling in a reader means that the message is being delivered very well. I read the book by myself while my wife read the book with my son Cameron. So I’ll give you an idea of what we both think. For me, I found it quite intriguing that autism is never actually mentioned. It’s also quite brilliant, in that it’s just another one way that everyone is different. So rather than single out any specific disorder or ailment, you’re left to fill in the blanks as you read about those that can not speak, see, hear, walk and so on. These children on the pages all have different strengths, weakness, colours, sizes… and they all have smiles. I can picture my son in those illustrations just as I can picture other children that I’ve met through my life or that I know right now. They can all fit into these pages. More so than that, I can see myself in many of the pages. As you read about how some children are shy, some aren’t, some don’t like to do some things, other do… and some children cry because of how hard it is to make other people understand them… you get it. Both as having memories of that but also in understanding where her grandson as well as our own children are coming from. The book gave a good sense of accepting those who have differences and allowed Cameron the opportunity to look passed himself and see others and accept and want to help them. We were able to talk about the book and explore ways to make people in our lives feel more welcome and loved even though they have differences. Together, we both felt the only criticism we could make is that it’s a bit of a dry read, in that there is no story and comparing differences makes for a bit of repetition. Our four year old lost interest half way through. Cameron, however, did not. But it was never meant to be a story and no one will ever fault a four year old for not grasping the differences of all people. So while it may not make the best bedtime book ever, it does make for a wonderful story time book that really helps to reinforce acceptance within us all. If more people read this book to their children, there would be far less bullying in the world.